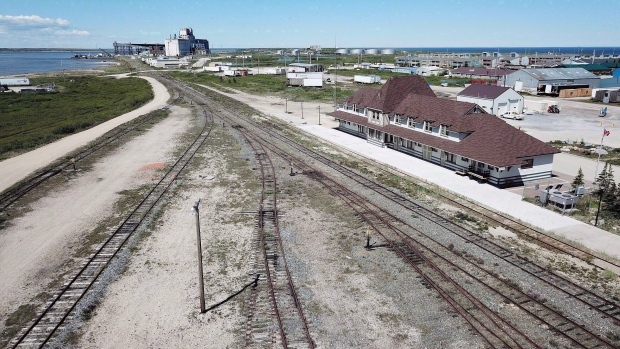 WINNIPEG -- The agreement to restore rail service to the town of Churchill in northern Manitoba will include at least $117 million from the federal government. The federal funding consists of $74 million to help repair the damaged rail line and buy it, along with the town's port, from Denver-based Omnitrax. Ottawa is also committing another $43 million over 10 years to subsidize operations of the rail line. "Repair work on the rail line has already begun ... and every effort is being made to complete the work and restore rail service before winter sets in," International Trade Diversification Minister Jim Carr said at a news conference Friday that offered few details on what others involved in the deal are putting up. The rail line is the only land link to the subarctic community of 900 people, known for its polar bear tourist season and port on the western shore of Hudson Bay. The line was washed out by flooding in the spring of 2017. Since then, goods and people have had to be flown in and prices for groceries and fuel have skyrocketed. The tourist economy was hit hard, and some residents left town. Two weeks ago, after months of negotiations, a consortium called Arctic Gateway Group hammered out a deal to buy the line and port from Omnitrax, which had said it was losing money on the service and could not afford tens of millions of dollars in necessary repairs. The consortium includes several northern communities, Toronto-based Fairfax Financial Holdings and AGT Food and Ingredients, a Regina-based supplier of pulses and food ingredients. Carr and consortium officials would not reveal Friday how much money the consortium partners are putting in -- they referred to an unspecified pool of money -- or how much money Omnitrax is being paid. Carr would also not say whether the federal government would put up more money if its annual subsidies are not enough to prevent losses. "You don't talk about hypotheticals in this business." The rail line was once government-owned, but a former Liberal government sold it to Omnitrax in 1997. The rail line suffered from high maintenance costs due to the vast boggy terrain it covers, and lost a key customer when the Conservative government in 2012 moved to end the Canadian Wheat Board monopoly on western wheat. Carr said the new ownership group, which includes a built-in customer base with AGT, will make the rail line viable. Fairfax's president was equally confident the restored line and port has untapped opportunities to ship goods to and from other countries through the Arctic. "The Russians -- we have roughly 50,000 people north of the Arctic circle, they have a million and a half people and I said, 20 per cent of their GDP (goes) through there," Paul Rivett said. Churchill Mayor Mike Spence said the months that have passed without rail service have been hard on the town. But people from other parts of Canada reached out. 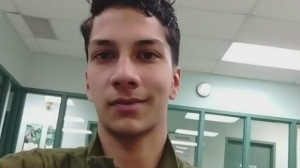 "I had people sending food hampers ... high school students sending cards and school supplies," Spence said. "So we never felt alone."